Apartment located in Bundoran, County Donegal near to Ballyshannon, can sleep four people in two bedrooms. 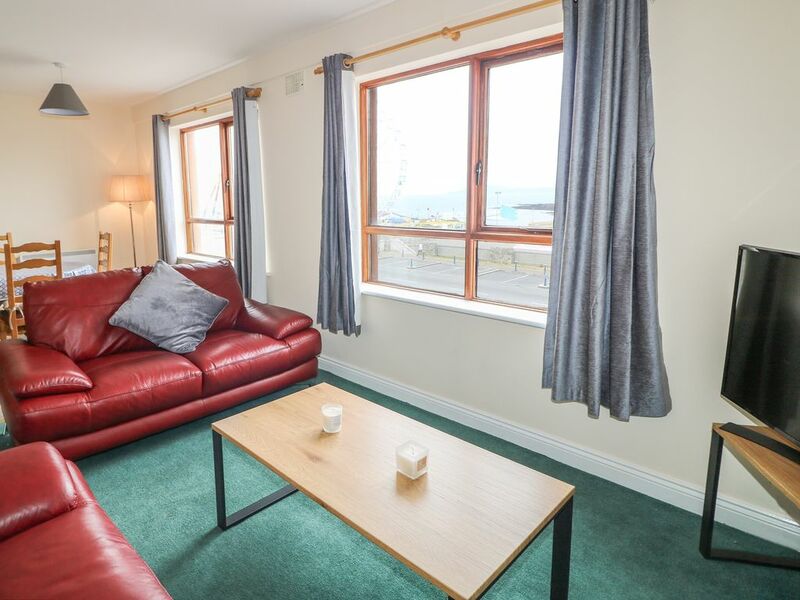 Apartment 42 is a two bedroom apartment overlooking the North Atlantic Ocean in the town of Bundoran in County Donegal. Hosting a double bedroom, twin with en-suite and a separate bathroom, this property can sleep up to four people. It also includes a kitchen/diner and sitting room. Off-road car parking is available at the front of the building. Apartment 42 is a superb holiday base for families and friends alike, with much to see and do in the area. It provides stunning views of the nearby coastline. Amenities: Oil central heating. Electric oven and hob, microwave, dishwasher, washing machine. TV. Fuel and Power inc. in rent. Bed linen and towels inc. in rent. Off-road car park at the front of the property. Sorry no pets, no smoking. Pub 2 minutes walk, shop 4 minutes walk. Town: Bundoran is situated in County Donegal and is one of Ireland’s most popular resorts. Bundoran will suit all tastes, a day out can be spent at the Bundoran Adventure Park, or at Waterworld. Cliff-top walks around the town are a must, plus there are many golf courses in the area, including one in Bundoran itself. Close by is Ballyshannon, the oldest town in Ireland, which boasts a folk festival every August and offers shops selling local crafts, pubs, restaurants, a leisure centre and a beach. Rosses Point is a short drive away, plus Benbulben, part of the Dartry Mountains, and the whole of Donegal are within driving distance. Oil central heating. Electric oven and hob, microwave, dishwasher, washing machine. TV. Fuel and Power inc. in rent. Bed linen and towels inc. in rent. Off-road car park at the front of the property. Sorry no pets, no smoking. Pub 2 minutes walk, shop 4 minutes walk.